Jeff Goldblum is a cacophony of charisma just waiting to explode. First, there was his, let’s say, unique take on the Jurassic Park theme, and now he’s been opening up about his Jurassic World 2 role. In case you hadn’t heard, he’s back as Dr. Ian Malcolm. Life, as they say, finds a way, but you won’t be able to find a way to stop watching this slice of Goldblum magic again and again. In an interview with Radio Times, Goldblum schmoozed his way through a potential landmine of a question when asked about his upcoming return as the good doctor in Jurassic World: Fallen Kingdom. He didn’t stop there. Because why would he - he’s Jeff freakin’ Goldblum! 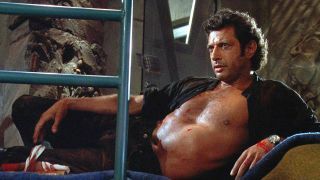 He went on to speak about Ian Malcolm’s fashion sense, indicating that “he might put on a nice dark bit of clothing here and there… and a tinted glass maybe.” If the prospect of seeing Jeff Goldblum is an open-buttoned shirt yet isn’t making you rush to buy tickets then I’m not sure what will. The Thor: Ragnarok Grandmaster also has his own bit of headcanon when it comes to what Malcolm has been doing since the events of the first Jurassic Park. It’s interesting, to say the least: “He opened a jazz club, probably, and he’s been playing every Wednesday.” Well, there it is. Peak Goldblum. Speaking of Thor: Ragnarok - it’s just around the corner. Be sure to check out 5 questions we have after watching Thor: Ragnarok (spoilers, obviously). Also, here’s how many post-credits scenes are in the movie.